배창희, 이경록,(2011).신뢰도 가중 HMM 디코더를 적용한 음성인식 성능평가.한국정보기술학회논문지,9(2),33-41. 자동음성인식은 모바일 환경에서 가장 자연스러운 인터페이스 수단이지만, 채널 특성 또는 부가적인 주변잡음에 의하여 성능이 저하된다. 본 논문에서는 화자인식에 성공적으로 적용된 신뢰도 가중 HMM(RW-HMM) 디코더를 음성인식 문제에 적용하여 그 성능을 평가하였다. 신호대 잡음비(SNR)에 기반한 신뢰도 함수를 사용하였으며, 신뢰도 함수 최적화를 위하여 유전자 알고리듬을 채용하였다. 화자수 105명의 숫자음 음성 DB를 대상으로 성능 검증 실험을 수행하였다. 실험결과, 각 잡음환경에서 기존의 방법에 비하여 성능이 향상되었으며, 특히 백색가우시안 잡음환경의 경우 각 SNR에 대한 인식률이 4.6~16.3% 상승하였다. Automatic speech recognition (ASR) is most natural interface approach between man and mobile devices. But, the performance of ASR is severely degraded with additive noises or channel distortions. As a noise-robust method, recently RW-HMM decoder was developed and evaluated in speaker identification domain. 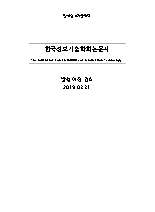 In this paper, to enhance the ASR performance we apply RW-HMM decoder to ASR and evaluate the performance of RW-HMM decoder in the task domain of Korean digits recognition. We adopt the SNR-based reliability measure and optimize the reliability measure by genetic algorithm. Based on a Korean digit database of 105 speakers, we perform the comparison experiments and show that the RW-HMM decoder achieves the better results compared with the CMS(cepstrum mean substraction) based baseline recognizer. In case of WGN, It shows 4.6~16.3% enhancement on each SNR.